Thanks for posting the vid. I don't know how there are dudes out there in the 1:35 region. On another note, I have to start using FRAPS for some research I am doing with VBS2, but I am concerned about the resource impact I have seen with the free version I have been using. Is the full version different? Your video seems very smooth. I am going to run the Mustang for the rest of the season. Hope to see you all in some practice sessions this week. I really need to work on my iRating. Sorry I missed the session. I didn't see the post till it was near over. I did run the Skippy last night at Watkins Glen (test mode), and ended up with a not-great 1:32.7. While you guys were running Mid-Ohio, I was watching the aforementioned Skip Barber "Going Faster" video that I got from Netflix yesterday (still waiting for the book). I learned a lot. For example how to go about finding proper turn-in and track out points on a corner. I've basically just been guessing, and inconsistent. I also learned that braking is critical, and quite a difficult art to master. And holy crap, manual shifting (and blipping) looks HARD. Not sure I could learn that. I bought FRAPS last year to do some work with Flight Sim X. What do you use for editing? I picked up Sony Movie Studio HD last year, and it's great. (it's Vegas Lite, basically). I wasn't aware that the free version of FRAPS would even capture video. I thought that was limited to the full version. As for the smoothness, you can lock in a frame rate, say 30 fps, and it will capture at that rate. What do you mean by the resource impact? what kind of issues are you having with it? As for us all running together, I'm not sure it's going to work out like we're hoping. I'm fairly certain that my puny i-rating won't let me run in the same splits with you guys. My plan has just been to sort of practice a lot on my own, mostly in test mode, to continue to learn and improve, and then move into a more competitive mode next season. I'm still happy to run hosted sessions with you guys any time, and I'll occasionally run public practices and races, and TT's, to gradually build up my SR. I picked up 7 SR last night running an Nvidia Cup race at LRP. But, if we all focus on the same thing for the week, every weekend we could run some private races at the same track/car with better likelihood of close competition. That was my line if thinking anyway. There is a freely distributed version of FRAPS that supports video capture, with FRAPS ads. I will look into it more. I haven't tried using it on my monster desktop. The laptop sim performance decreased dramatically when FRAPS started recording. @Jeff: Hope you're enjoying the movie. Lots to be learned. I've got a manual transmission in my car and I blip almost every downshift. It was reading that book that made me start practicing, and it makes a cool race car sound when ya do it right. I cannot, however, use a clutch in the game. There's not enough feedback for me to know how it's engaged so I let the computer do that auto-blip thing for me. For editing I just use the Windows live movie maker. It's got a thing where it publishes directly to youtube and I'm not trying to be creative; just post some video so it's adequate. I've got a copy of PremierPro around the house somewhere, but I think that's a bit more than my needs require. @Static: I don't think the full version is fundamentally different than the demo. The full one simply allows recording of more than 30 seconds at a shot and removes the "fraps" watermark. I'm not crazy about it's performance even on my machine (I-7 / 12 gig ram / gtx580 / etc). I think what might help it is to record the movies to a drive that's not the one you're using for the program or the swap file. I need to check that and see if a USB drive could keep up with the stream of info coming in. The files it records can get very large very quick. I do all of my recording at "half size" - which for me is... (calculating)....960 x 600 (not quite 720P). I tried recording at full size and my game got choppy pretty quick due to the hard drive thrashing. I'll investigate the USB idea. That might have merit. I need to look, but there's a site I stumbled on once that explained how to configure the settings in Fraps / Windows to get good recordings. I don't know why I never bookmark that stuff. Anyone have any opinion about running the Pusstang's aside from Senor Static? Jeff, you going to do the Skippy's, or would you wanna drive the pony car? You guys are mentioning the sim getting choppy when recording ... the way to do it, I would bet, is to just save the session replay, and then when viewing that, then you turn on FRAPS to record. That way you can rewind, fast forward, etc, and cap exactly the segments you want. That's what I did in Flight Sim X last year. There's an add-on for that called FSRecorder, and I'd use that to save flight replays, then use FRAPS to cap video from the replay. I'll go with whatever. I'm not going to be focusing on anything, but will do any practices or hosted sessions you guys want. If I had to choose a 'focus' car, it would be the Skippy. I do think Static is right in that it's a good trainer, which is what I need. I'll admit to a bit of Fraps-envy. But not $37 worth of envy. I ran an online practice session last night in the Late Model and wow what a wreckfest. I had some issues early on since I couldn't find an online setup that 'fit'. I made my own, and I'm actually pretty proud that I did and the car handles well. Not the fastest (am I ever? ), but very stable and driveable. About half of the other drivers on the track couldn't get around 2 laps without spinning and causing multi-car pileups. It bodes well for chances at a top 5 finish, but kind of like russian roulette since you could be wrecked and end up with a DNF. You don't end up with a DNF for wrecking. You just get a pit tow, and subsequent 1:30 delay, then you're good as new. Drive back out and finish the race. Don't ever quit due to a wreck. I did that early on and it was a massive hit to my iRating. It is far better to finish 4 laps down (or whatever) than to disconnect. I had 1 race where i wrecked and pitted, but the car still wouldnt drive straight. Maybe only if you get towed in? Yeah, what I did was to hold Escape, and that puts you back on pit row, then you get a 90 second hold timer, after that, I was released and could drive normally. Someone said on the iracing forums that Shift-R got you the fast tow / fix. Not sure if that's implemented at all, but maybe worth investigating. I was driving earlier at Mid-Ohio in the Rustang and found that if I start with the baseline setup. Change the front ARB to soft, and lower the ride height 1 click on all 4 corners, I got a 1:39.2xx on my 2nd lap. I also found that you can really slam down on the breaks (and have to) much harder than you can in other rides. The car is almost 2 tons with what are essentially street breaks. Just make sure you're going straight when you do it. Ran my first SK Modified race. South Boston, a track I know and love in any car. I made sure to qualify, and even though my time isn't great, I end up 3rd. That's right, only 2 others bothered to qualify. Less than 10 laps in (of 65), I hear some swearing on chat and it becomes evident that behind me must have been a massive pile up. My entire radar screen turns blue, with exception of 1 car in front of me. I'm doing my own thing, just trying to run clean laps, but when the lapped cars start coming back out, I let them race each other and I get out of the way, since I'm not on their lap. About lap 40, someone comes out of the pits and I guess either threatens to hit the leader, causing him to off line..or hits him..because I become the new leader. Well, as luck would have it, my kindness gets punished as I keep letting lapped cars through to race each other and stay out of their way (in my mind, no sense pushing it because there is no one else even on my lap now), but I go high on a corner to let 2 cars through and gently scrape the wall. That little bit makes my car incredibly difficult to keep on line, and after another scary lap where I feel like a menace, I decide I have no choice but to pit. So I do. Somehow, I completely drive past my stall, and I'm back off pit road and have to go around again. This time, I pit properly, but the lapped cars are now back on my lap..ahead of me! Nothing else really changes over the remaining laps and I finish a disappointing 7th or 8th. It is entirely my fault I didn't come away with that win. I was in the lead by over a lap on every other car and blew it. Any more hosted sessions in the works? I'm terrible but clean. Welcome aboard! I'm sure we'll be doing more hosted sessions soon. What is your iRacing focus, ovals or road (or both)? What content do you have so far? Let me know if you'd like me to add you to the list in the OP so others can find and friend you on the iRacing site. I like both oval and road - I generally stick to the lower power cars but I am more than happy to try out new ones. FRESH MEAT!!! MMMMM.... Tastes like Rookie! Seriously though - Good to have you with us, Neal. As for Don - Hey man, 7th or 8th is respectable. A top 10 finish should never be referred to as 'disappointing'. Ya drive, Ya learn, Ya come back next week and do it again. If you're lucky or diligent, you improve. If not, well, then you just have fun. I think I'll host up a fun-run this weekend - like we did last Saturday morning. Skippy's at Limerock - anyone interested? Start around 10:30 AM Texas time? I'm collecting iRacing replays, and would like every one I can get my hands on. So if any of you guys have them, I'd appreciate it. For those that don't know, they are located in the My Documents/iRacing/replays folder. Easiest way would be to zip them up, and drop them in your Dropbox Public folder and provide the link. You do have Dropbox don't you? Anything in particular you're looking for, Jeff? I have some that I've saved, either because I wanted to watch my laps, or remember how to run a certain track when it comes around again, or check someone else's laps, or to look at some crashes. I'll take anything you're willing to share! thanks. PM me your email, Jeff - I'll send em to ya that way. Thanks Don & Shane. Much appreciated. Don, I got yours downloaded, so you can delete them from your dropbox if you want. Would ya LOOK at what the UPS man's bringing me tomorrow! Well... ya see. 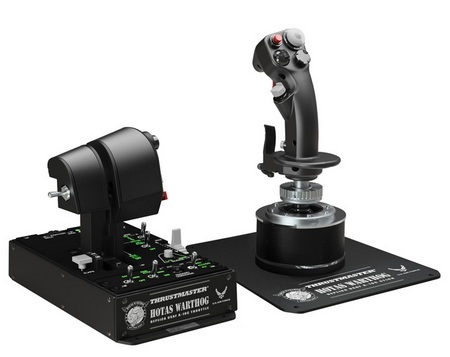 If you were to purchase that way-cool Warthog joystick, it can be used very easily for both the A-10 sim AND the upcoming Cliffs of Dover. I'm sure I'll be picking that one up too when it comes out, but I'd like to hear how the flight model, et al, is improved / different from IL-2. I've got several buddies that fly the IL2 from time to time and if it's a nice improvement, I may be able to talk them into a purchase. enable.enable.enable. Still looking at hosting up Skippys at Limerock this Saturday @ 10:30 AM. Due to the limitations of the server and how much time you can actually have for 3 bucks, I'm going to do it like last week as well. 160 min Practice - 30 min open qualifying - then... what 20 lap race? 25?30?... Not sure how long a lap takes, but I'm shooting for about a 30 (ish) minute race. Unless y'all would prefer longer...? Maybe i'm just pre-coffee, but I don't see any links. I see the ECCI link (awesome setup btw), but not as to what you're getting. edit: ok, now I see a pic of the joystick. I've been practicing this, and have barely been able to keep the Skip on the track at LRP. Not sure how I'll do. I'll drop in & out for practice, and hopefully be able to keep it on the track in the race. Maybe I'll run conservative and use my newly installed rocket launchers to take out the rest of the field. what 20 lap race? 25?30?... Not sure how long a lap takes, but I'm shooting for about a 30 (ish) minute race. Unless y'all would prefer longer...? Standard rookie public races there are 20 laps, and that would be my recommendation. Did you get my last couple of PM's?